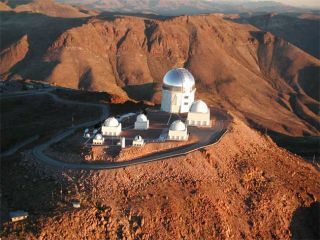 The new camera for the dark energy survey will be installed on the Blanco telescope in Chile. A special camera on a South American telescope aims to search for elusive dark energy, a force that may be pulling the universe apart at the seams. The so-called Dark Energy Survey, using a 570-megapixel Dark Energy Camera that will be mounted on the 4-meter (158-inch) telescope at the National Science Foundation's Cerro Tololo Inter-American Observatory in Chile, is set to begin later this year. Scientists reported on the new survey today (Jan. 11) at the 217th meeting of the American Astronomical Society in Seattle. "The camera is now undergoing final tests on a specially built telescope simulator at Fermilab," said Brenna Flaugher, Dark Energy Camera project manager at the Fermilab research facility in Batavia, Ill.
Over its five-year lifespan, the survey will create deep, color images of one-eighth of the sky, or 5,000-square degrees, to measure 300 million galaxies, 100,000 galaxy clusters and 4,000 new supernovas. It will construct the largest-ever map of the cosmic web or large-scale structure traced by galaxies and by dark matter. "The DES combination of survey area and depth will far surpass what has come before," said Dark Energy Survey director Josh Frieman, also a researcher at Fermilab. The telescope will take advantage of the excellent atmospheric conditions in the Chilean Andes to deliver images with the sharpest resolution yet for such a wide-field survey. This should enable the team to probe dark energy using a technique called weak gravitational lensing, which occurs when the gravity of massive cosmic objects warps space-time around them, causing light passing by to travel on a curved path. Over the course of the survey, each part of the sky will be viewed multiple times through five different light filters, creating a very large amount of data. The camera will capture more than 300 images a night, resulting in about 200 gigabytes of compressed, raw data, or roughly a million gigabytes of processed data, by the end of the survey, said Joe Mohr of Ludwig Maximilians University in Munich. The data will be processed at the National Center for Supercomputer Applications in Urbana, Ill., and delivered to collaboration scientists and to the public. The survey area is selected to overlap with other sky surveys that can provide additional data about the galaxies and clusters it views. These include the South Pole Telescope, which sees galaxy clusters as cold spots in the cosmic microwave background radiation, and the European Southern Observatory's Vista Hemisphere Survey, which will observe the same sky region in infrared light. The Dark Energy Camera is supported by funding from the U.S. Department of Energy, the National Science Foundation, funding agencies in the United Kingdom, Spain, Brazil, and Germany, and the participating DES institutions.